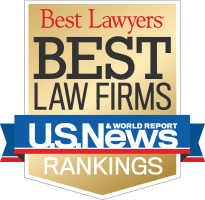 A firm must have at least one attorney who is recognized in the current edition of Best Lawyers in a "Best Law Firms" ranked practice area / metro area. As part of our formal submission process, submission packets are emailed to firms every January. Clients and/or Professional References are emailed a survey addressing a firm's expertise, responsiveness, understanding of a business and its needs, cost-effectiveness, civility, and whether they would refer another client to the firm. Client and Professional Reference submissions are always kept strictly confidential and are never shared or published elsewhere. Data is also collected from Best Lawyers ballots, which can only be completed by attorneys who are currently recognized by Best Lawyers. All of the quantitative and qualitative data is then combined into an overall "Best Law Firms" score for each firm. Because firms were often separated by small or insignificant differences in overall score, we use a tiering system rather than ranking law firms sequentially. *The number of tiers included in each practice area or metropolitan area ranking varies, and some specialties may not be ranked in metro areas in which there is not enough data to provide rankings in a particular specialty. Firms are notified of their rankings via email in late July. *Only one law firm can be awarded "Law Firm of the Year" in national-eligible practice areas. November 1st of each year.